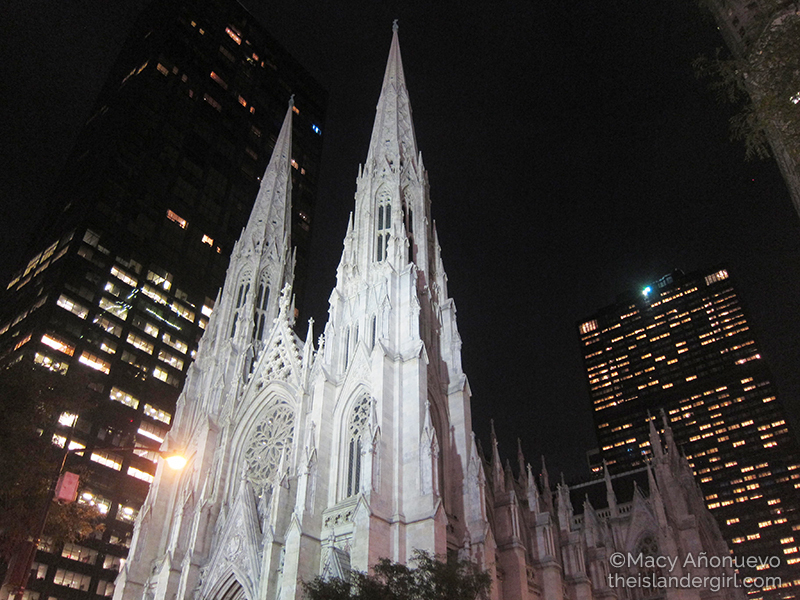 I kinda got lost while walking from St. Patrick’s to the NYPL. 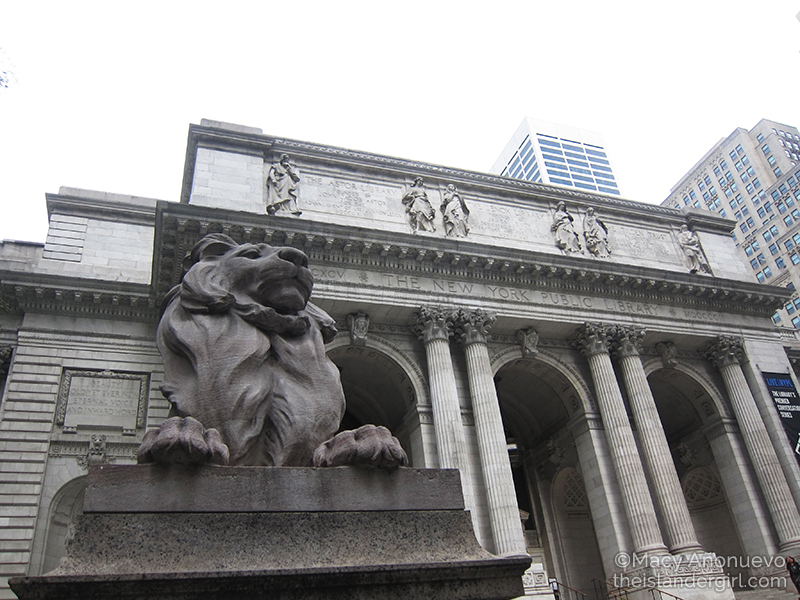 When asking for directions to the NYPL, specify that you’re looking for the main branch with the lions, as all the branches scattered around New York City are technically the New York Public Library. I could have spent the whole day here but alas, couldn’t do it. There’s a really nice exhibit about the Library’s history on the 2nd floor. I especially loved the part detailing how the collection of a certain branch of the NYPL changed as the neighborhood around it changed. 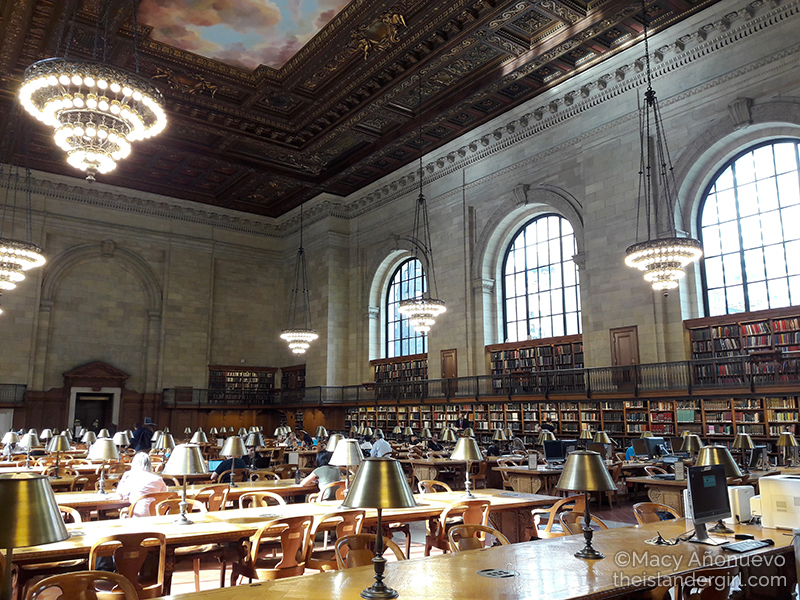 Seeing the famed Rose Reading Room is a must, but be sure to keep quiet as other people are definitely working. 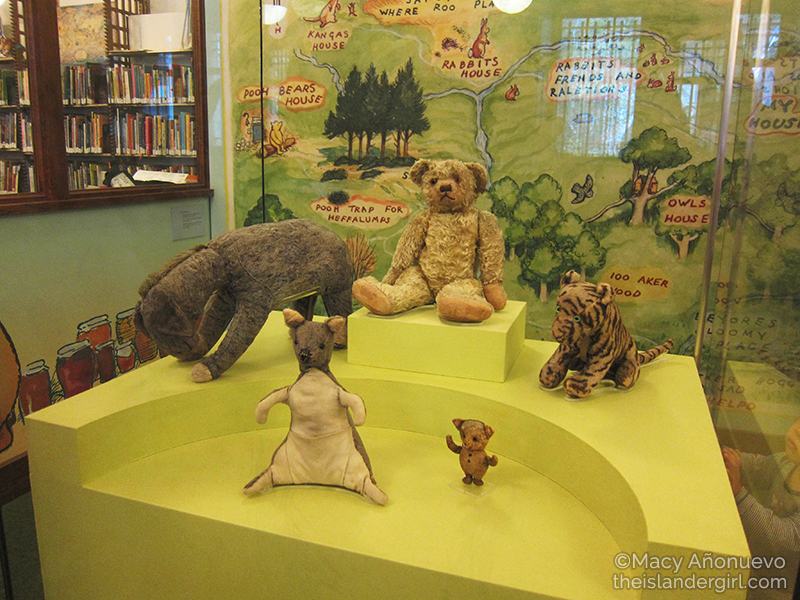 Pop on down to the Children’s section to see Christopher Robin Milne’s stuffed animals – the same stuffed animals that inspired A. A. Milne to write Winnie the Pooh. Also, use the library’s free WiFi to map out your route for the rest of the day. Confession time: I’m a sucker for museum and library gift shops. If I had more money, I would have bought everything in the there. 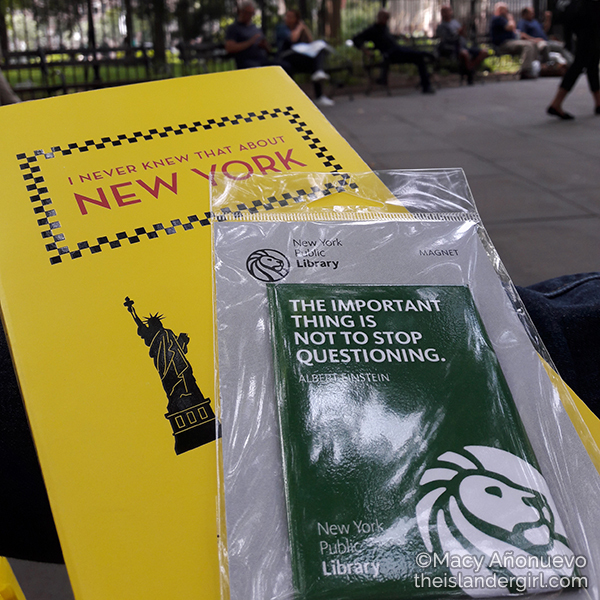 Due to limited funds, I had to content myself with a nice fridge magnet and a book about New York. 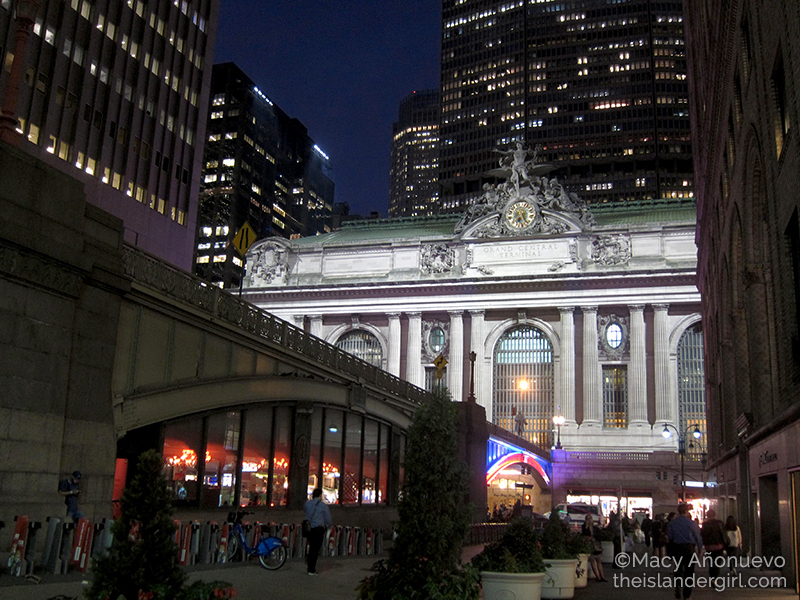 From the NYPL, take the #7 train from the 5th Ave station (if you’re outside and looking towards the library, it will be on the library’s right side) to Brooklyn Bridge/City Hall station, which is just beside the Manhattan side of the Brooklyn Bridge. 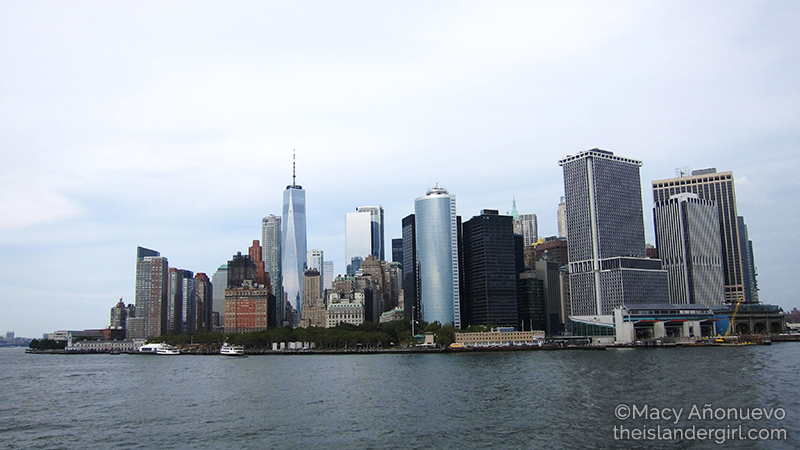 Walk across the bridge, stopping midway to take photos of the Manhattan skyline. I met up with my Tito Jun here. 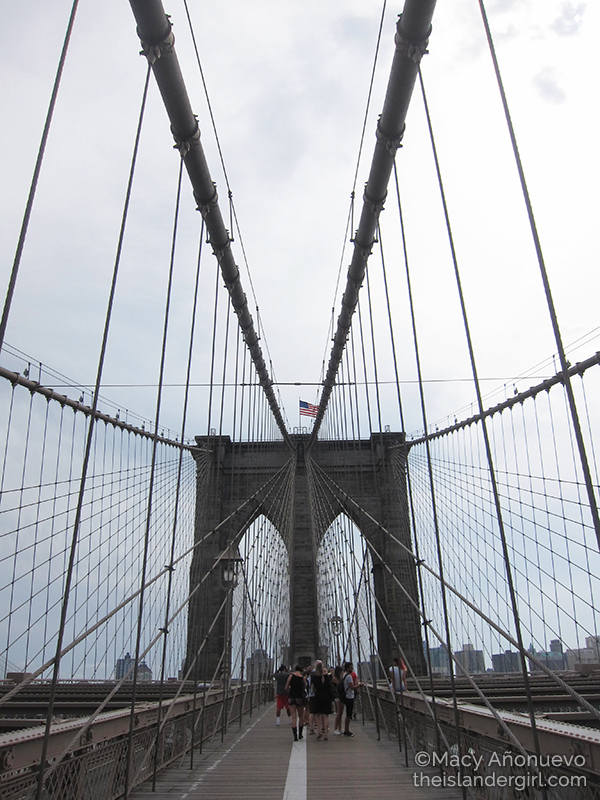 Tito Jun’s lived in NYC for 20 years and he’s never walked across the Brooklyn Bridge! “I just drive over it!”, he says. It’s a nice 2 km walk, with benches every few hundred meters in case you get tired. There are people selling food, drinks, and cheap souvenirs on the Manhattan side of the bridge. Be sure to keep to the “WALK” side of the crossing, lest you get beeped at and/or run over by rushing cyclists. Expect a lot of people there (both tourists and NYC commuters) so walking might be slow-going. Bring a jacket as it can get windy up there. 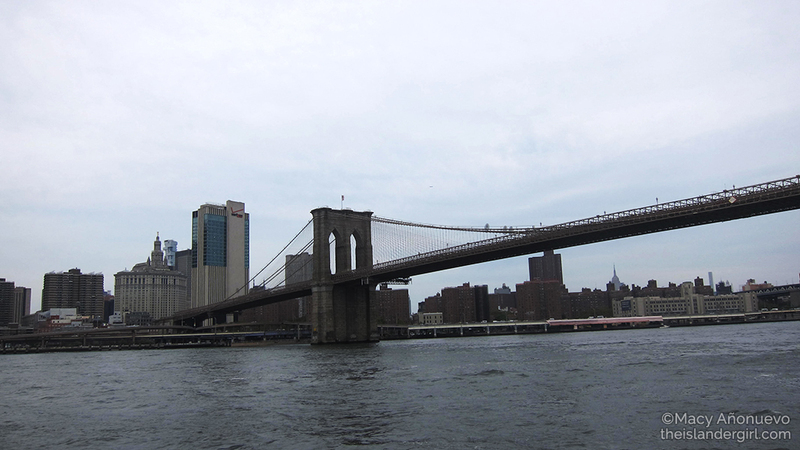 After you get off the Brooklyn Bridge, head on to Down Under the Manhattan Bridge Overpass for lunch. 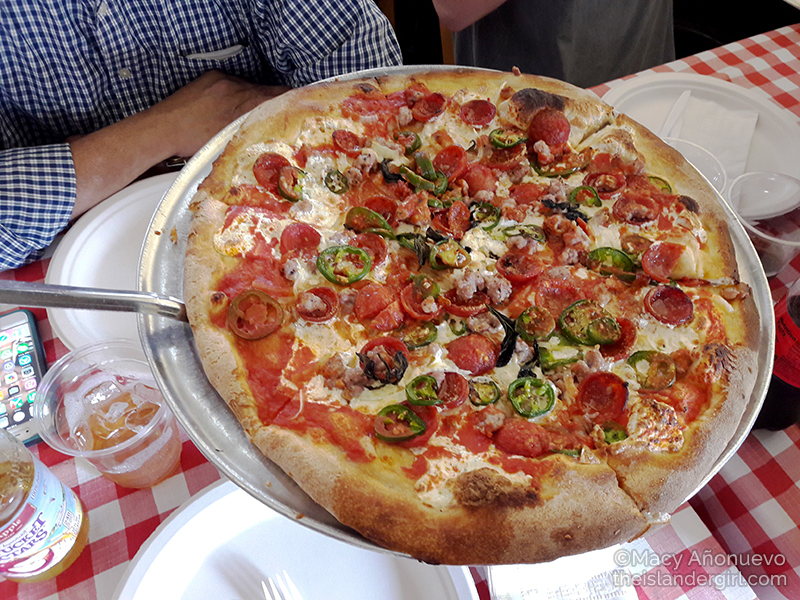 There are lots of different restaurants to choose from, but I dragged my uncle to Grimaldi’s because it supposedly serves some of the best pizza in New York. The line was long (all tourists, as far as I could tell), so we got a table after an hour. 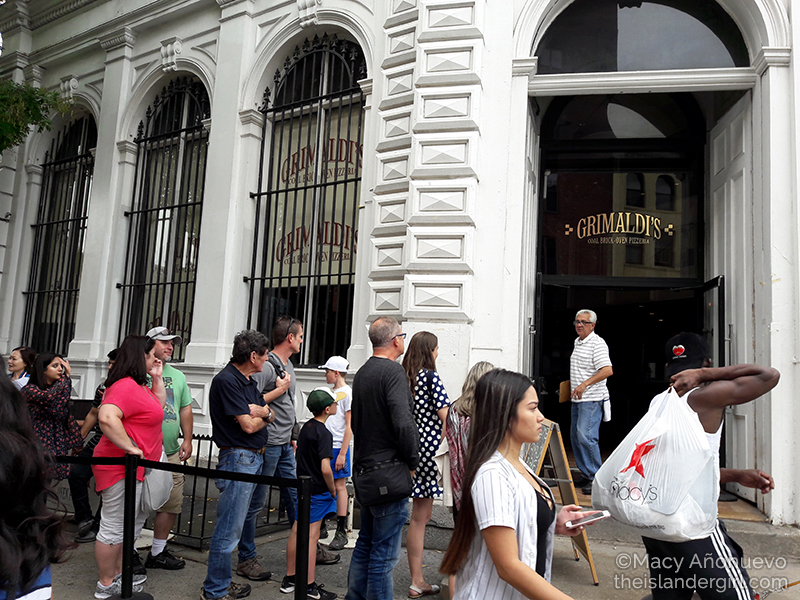 That hour passed quickly enough because my uncle and I were catching up, but it can get tiring as Grimaldi’s doesn’t provide any chairs for those waiting. 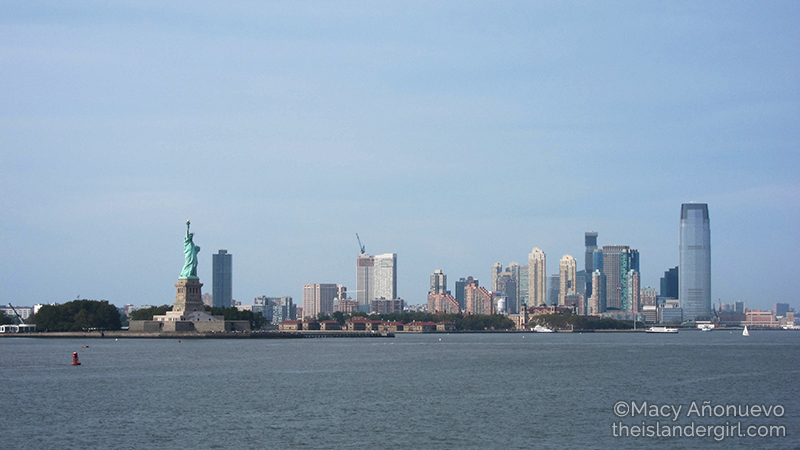 Take the East River ferry route from DUMBO to Wall St./Pier 11. The fare is $2.75 per adult, plus an additional $1 if you’re bringing a bicycle. 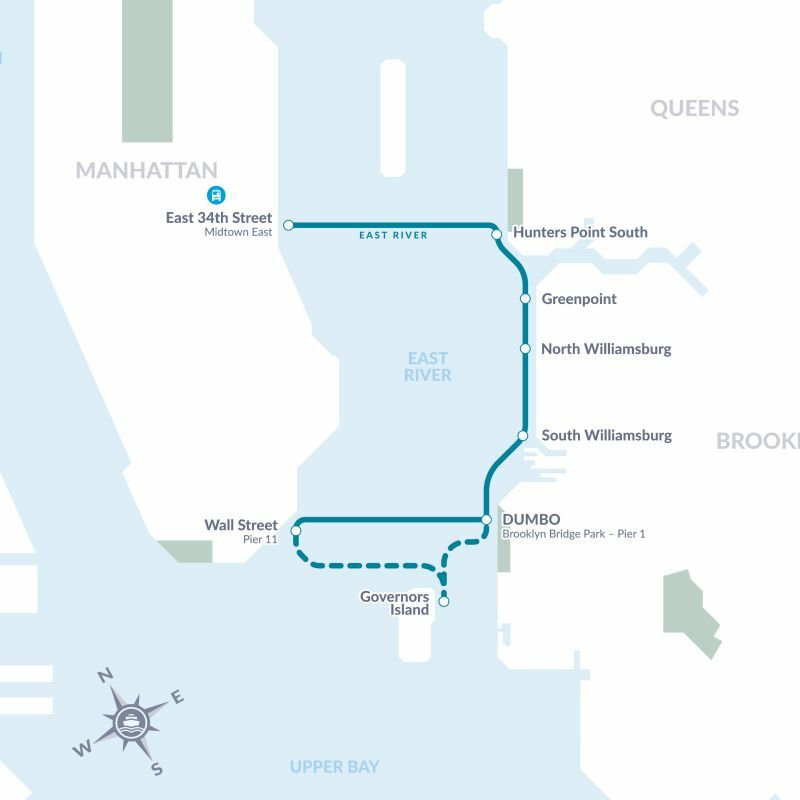 The trip between DUMBO and Wall St. is only 3 minutes but check the ferry schedule before you go, as the waiting time between trips can be as long as 44 minutes and the route changes slightly depending on whether it’s a weekday or a weekend or what season it is. 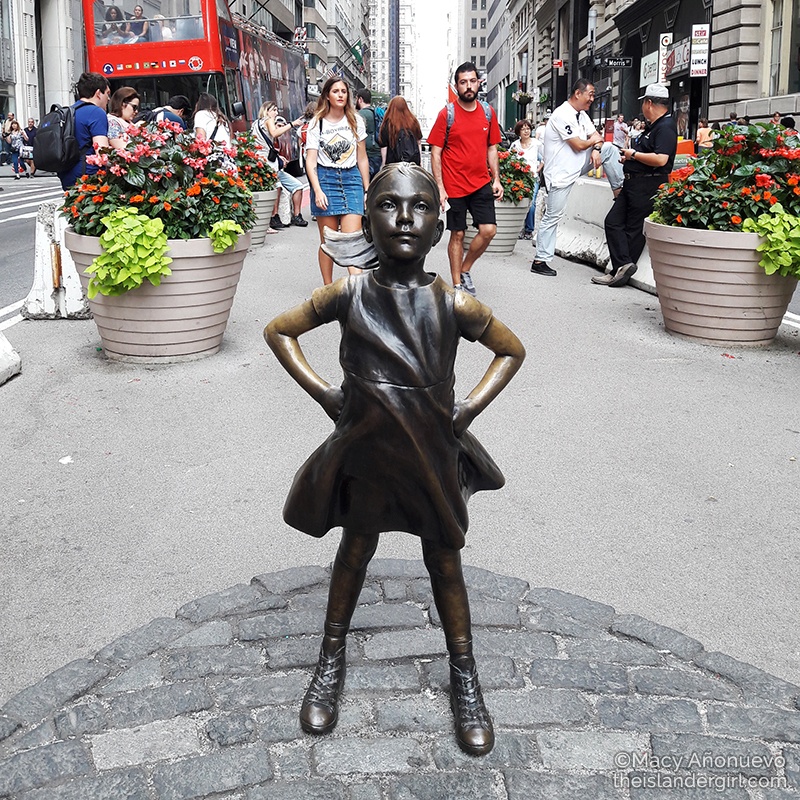 From the Wall St. ferry station, walk 900 meters to the Fearless Girl and the Charging Bull statues. 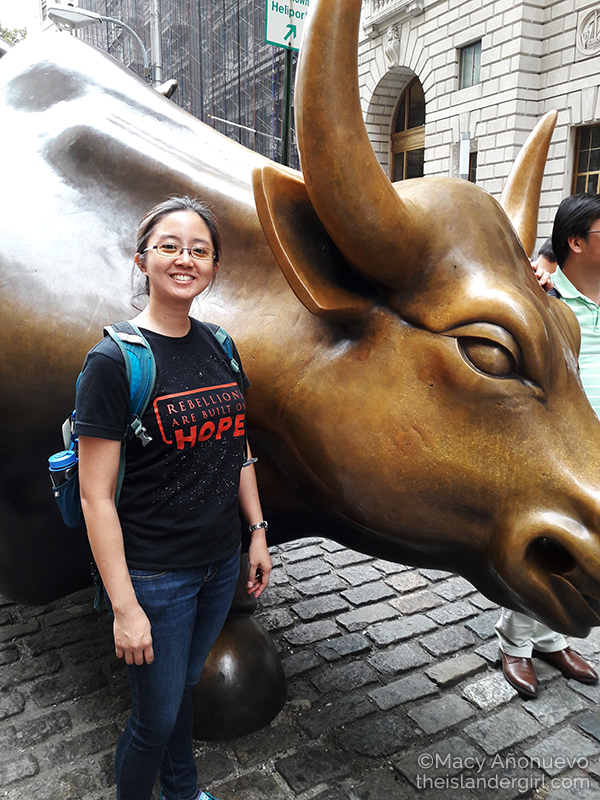 Contrary to popular belief, they’re not exactly on Wall St. but a few streets over on Broadway. There were a lot of tourists taking photos of and with the statues and there’s no formal line, so just be considerate and wait your turn. 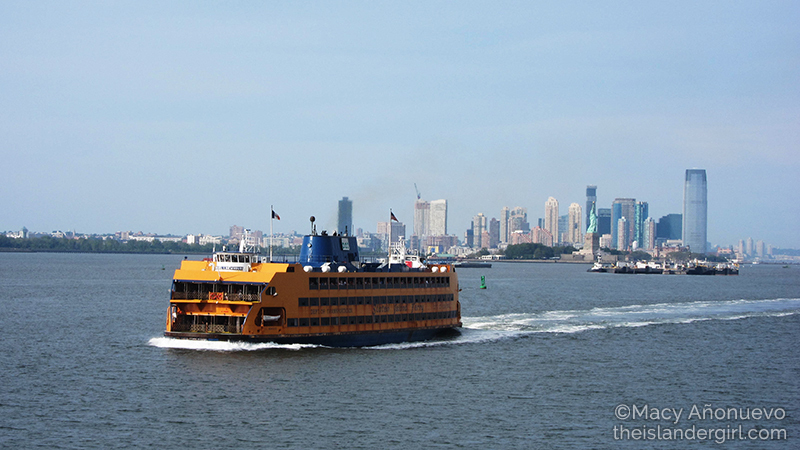 From the Fearless Girl and Charging Bull, just walk 450 meters to the Whitehall Terminal of the Staten Island Ferry. 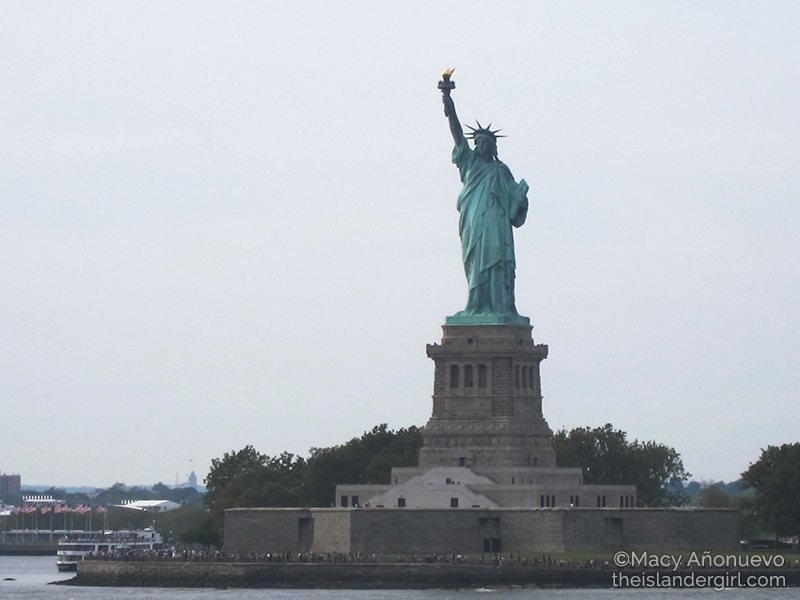 The ferry service is free, which makes it the cheapest way to see the Statue of Liberty. The trip takes 25 minutes each way. Because my feet are suckers for abuse, I needed to work my way northwards anyway, and I love food, I went to the Chelsea Market too. 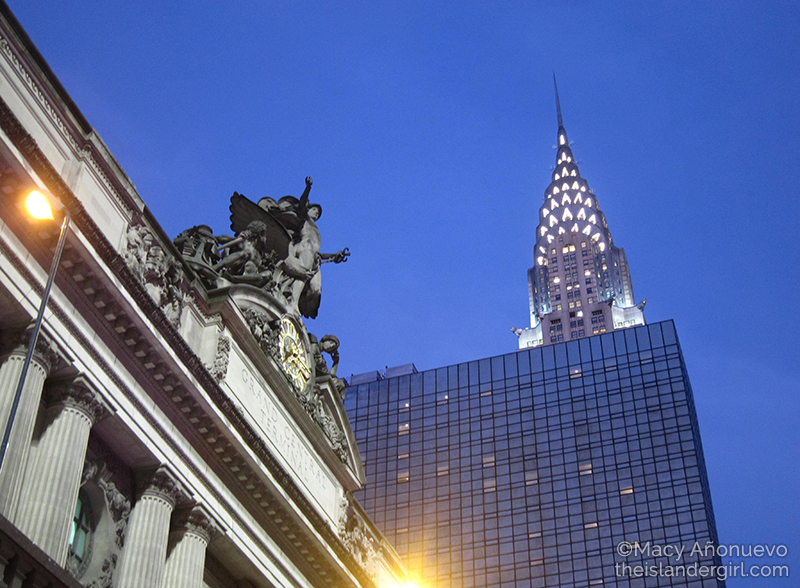 Take the #1 train from South Ferry station, get off at the 14th St station, and walk over to 9th St. I got lost because my T-mobile SIM was useless. There also wasn’t any free WiFi so I didn’t have Google Maps to get around. Tried using a paper map but couldn’t figure out how to orient it properly. Thank goodness for the pocket park where I got to rest my feet and open a map without looking like an utter noob. I figured it out eventually. 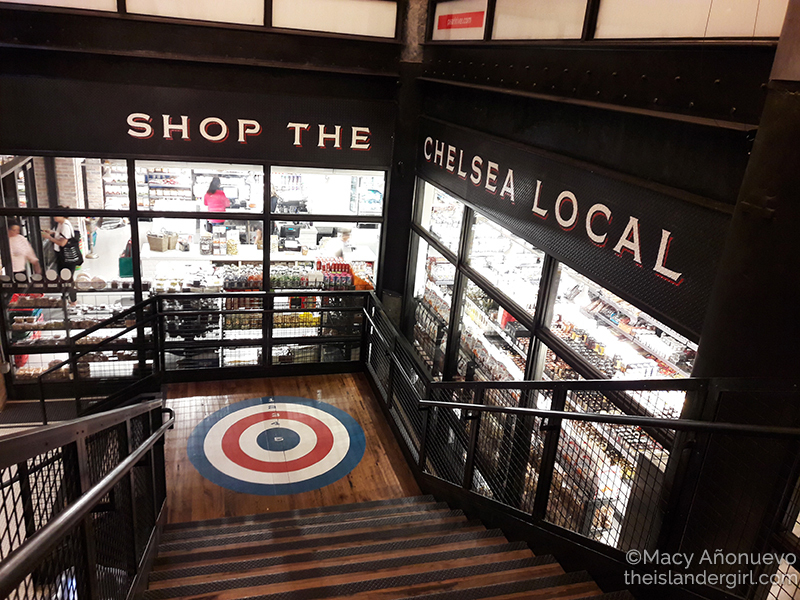 The Chelsea Market was my idea of heaven, with shops and restaurants serving practically all of my favorites. 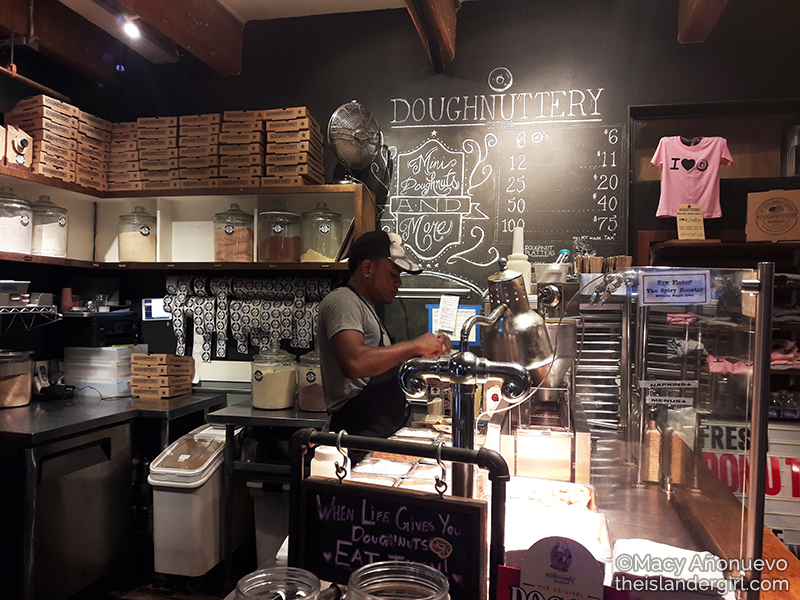 Due to my limited budget, I had to content myself with gelato from L’ Arte del Gelato, brewed coffee from Ninth Street Espresso, and doughnuts from Doughnuttery. 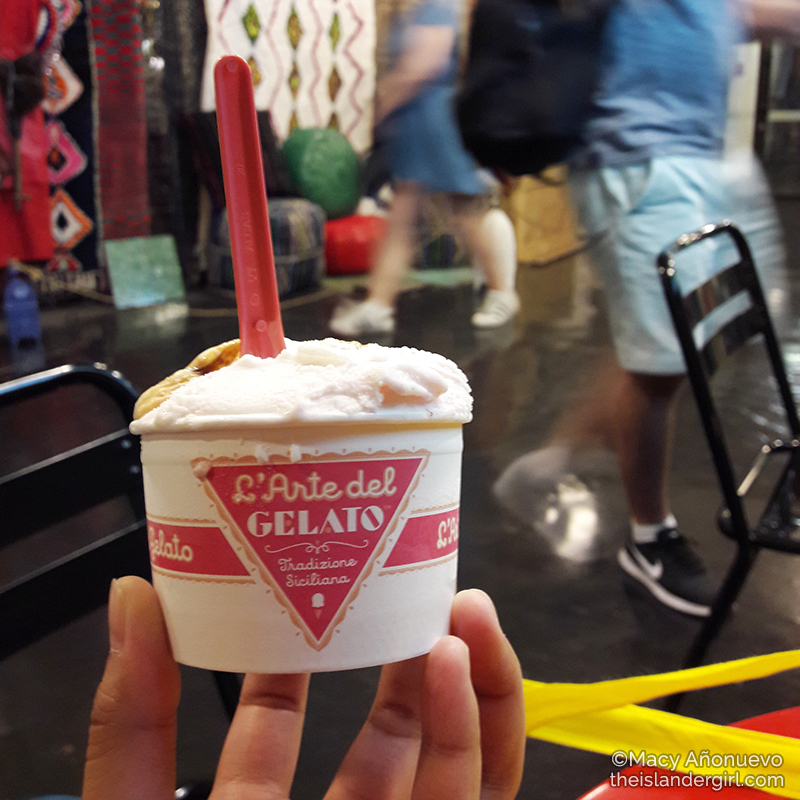 I loved the gelato. Perfectly creamy and perfectly delicious. L’ Arte del Gelato is also a pretty good place just to sit and watch people go by, though not many did since it was a weekday. I loved the brewed coffee too! It felt a bit weird but not to drink hot coffee after eating gelato but ah well. I saved most of the coffee to go along with the doughnuts. Unfortunately, the doughnuts were a disappointment. Doughnuttery mini doughnuts are rolled in flavored sugar and if you order a dozen, you can get a max of 4 flavors (menu here), so 3 pieces per flavor. I tried the cinnamon sugar, lemon, strawberry, and apple cider but wasn’t particularly wowed by any of them. 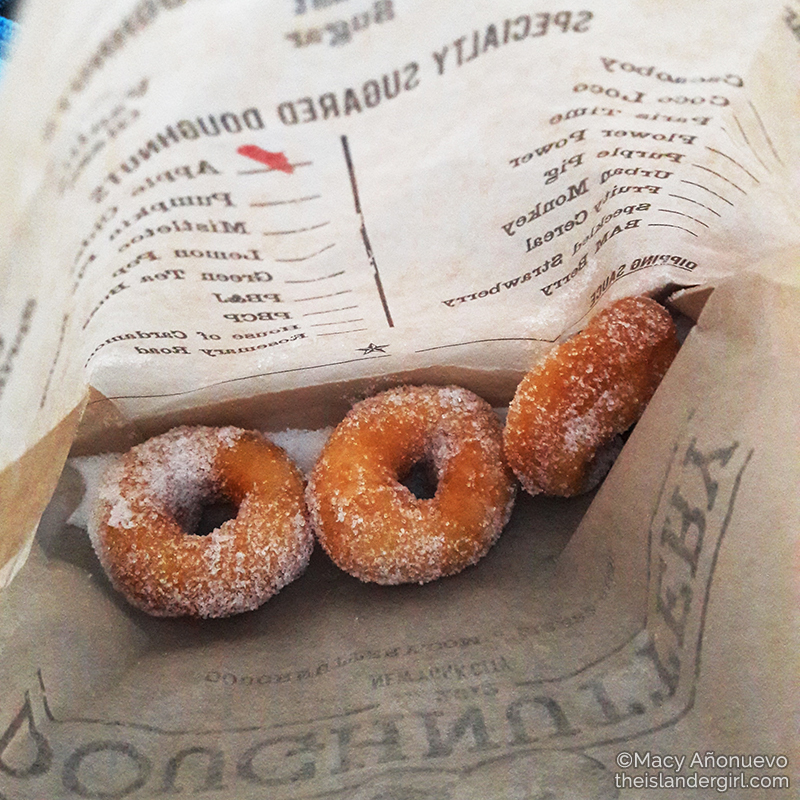 They tasted like the regular sugared doughnuts I can buy off the street in Manila. The High Line is a public park that started out as a freight rail line in 1934, running from Gansevoort St to West 34th St, between 10th and 12th Avenues. 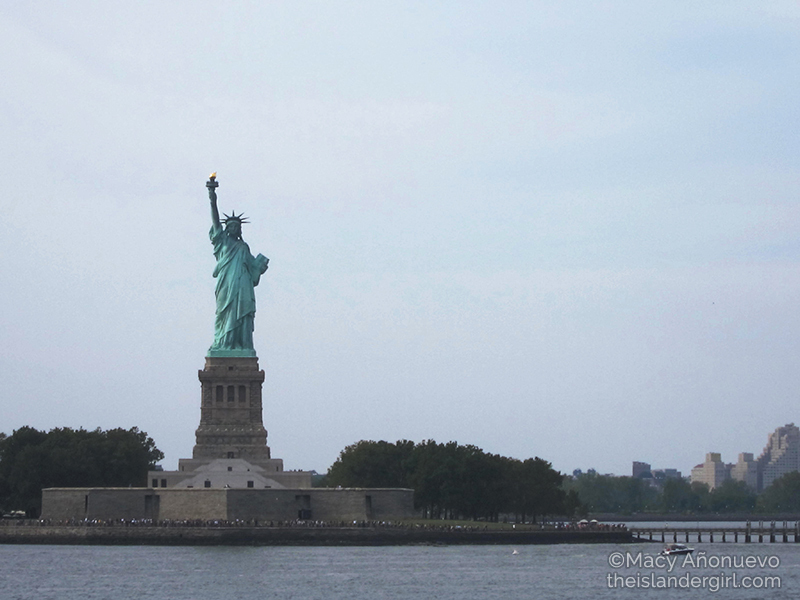 After it was decommissioned in 1980, it sat unused and was considered for demolition. But in 1999, the Friends of the High Line was formed to push for the High Line’s preservation and reuse as a public space. 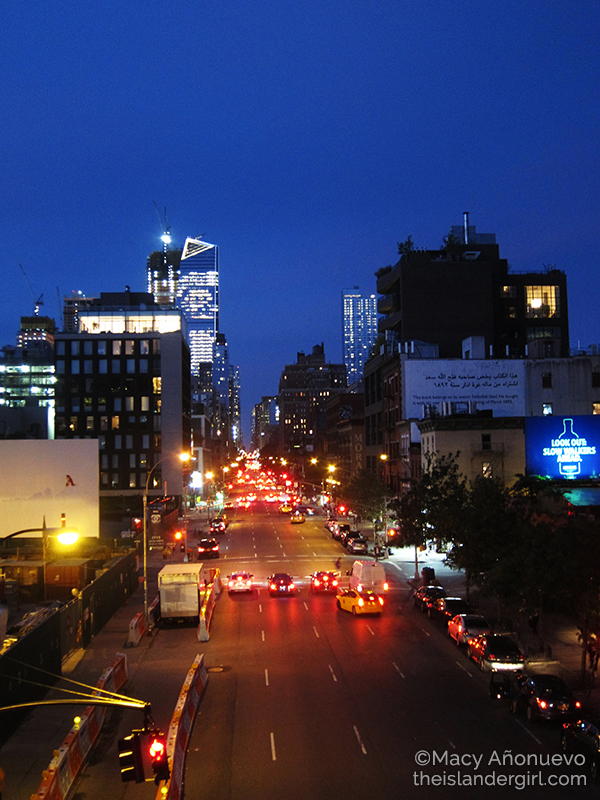 After ten years, the first section in Gansevoort St was opened to the public. There are several access points along the line, with the 16th St access being the closest to Chelsea Market. 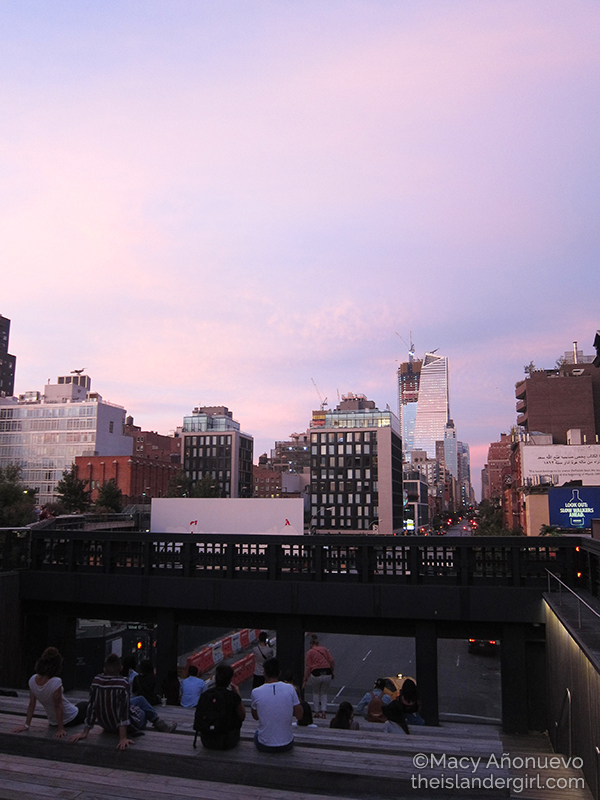 Walking along the High Line at sunset and night was a surreal experience. I snacked on doughnuts and coffee while watching the sky turn orange, blue, then black. I also got to watch the cars down below via a viewing window with stadium seating (so cool!). 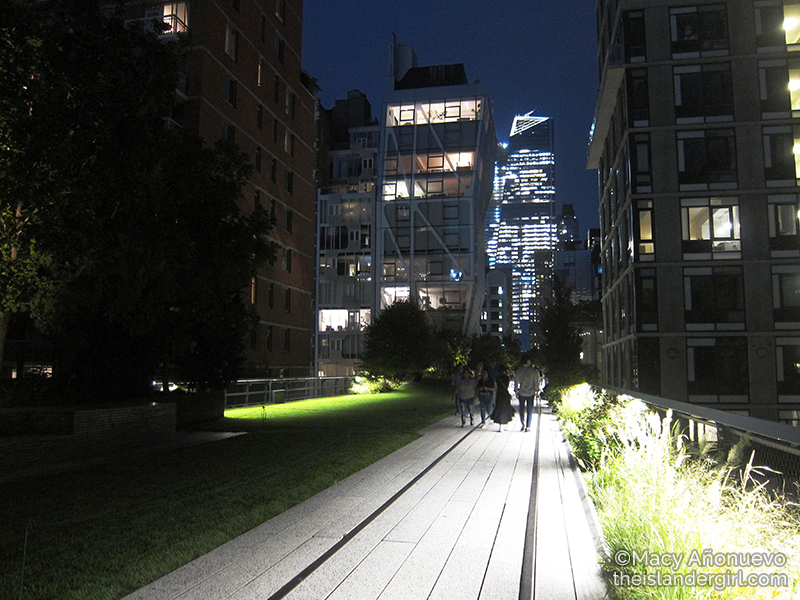 The High Line hosts activities throughout the year, ranging from plant tours, concerts, art displays and camps. 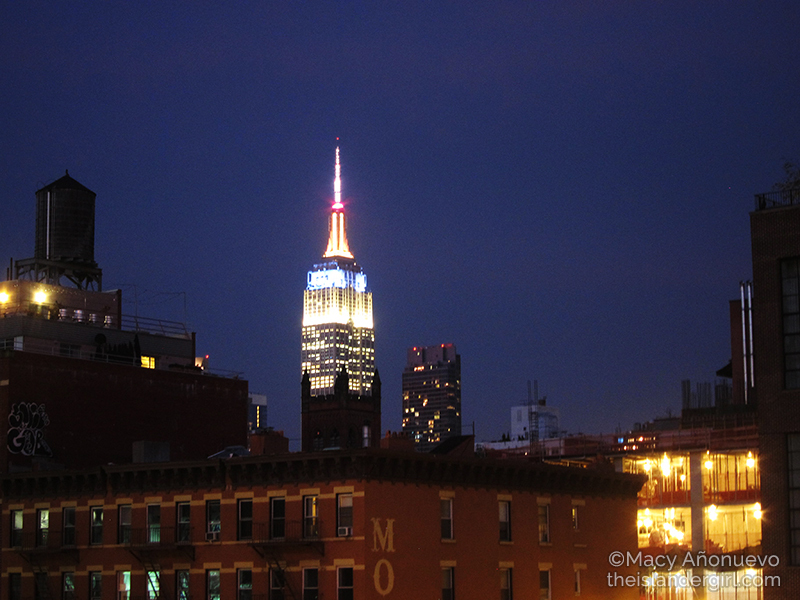 If you have the chance, visit the High Line again during the daytime. Note: You can skip Chelsea Market and the High Line in favor of One World Trade Center. The Downtown Connection Bus is a bus service that travels from South Street Seaport to Battery Park City, with 36 destination stops. It’s currently free but will start charging fares from February 20, 2017 to September 2019. After exiting the High Line at West 34th St, I decided to make my way back to the Vanderbilt YMCA. Yes, my feet were killing me. The only subway line that connects the two is the #7 line from 34th St-Hudson Yards station, and the #7 passes through Grand Central . 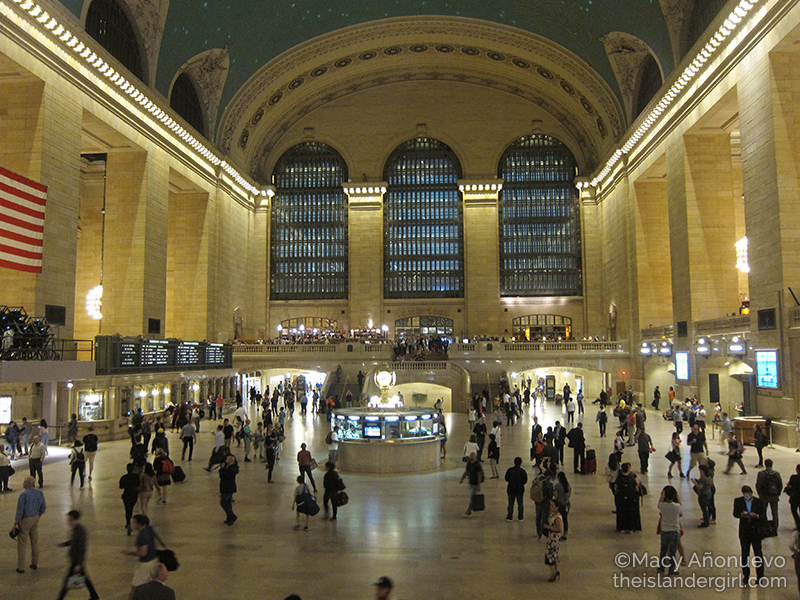 Holy hell, Grand Central is gorgeous! The terminal handles both intracity and intercity trains. 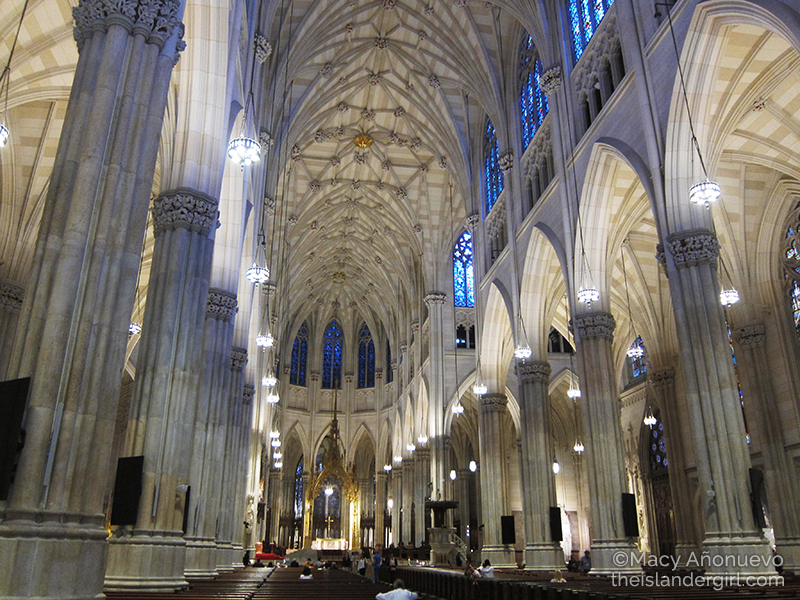 The main lobby is huge and has been featured in practically every every movie and TV show set in New York City. I was hoping to witness a dramatic reunion in the terminal, complete with jumping into the waiting person’s arms and spinning around. 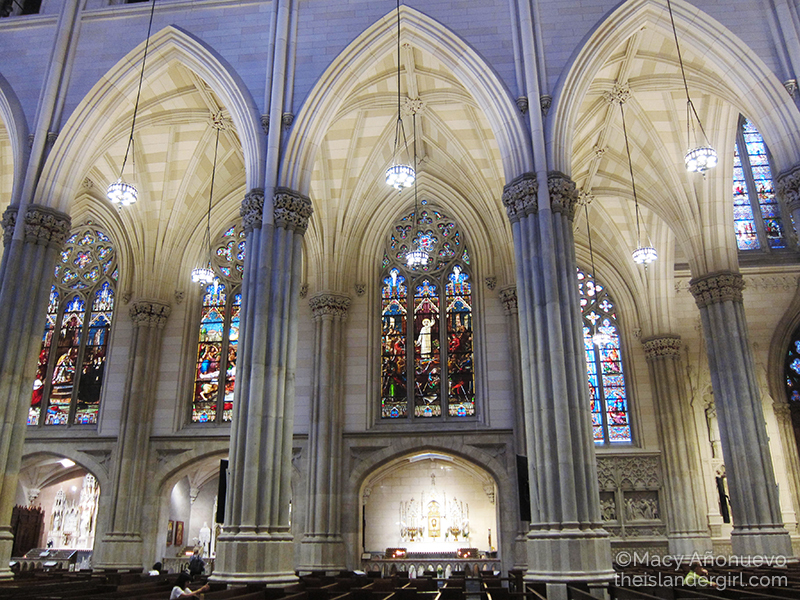 Be sure to look up too: the ceiling is decorated with the constellations. And thus ends a full-day’s trip around Manhattan! I thought about squeezing in a visit to the Top of the Rock but no, the feet seriously objected (I did that the next day). Luckily, they had enough gas in them to get me to the Grand Central branch of Midtown Comics and finally to the Vanderbilt YMCA. Google Maps. Yep, just had to say it. NYC has free WiFi in a lot of public places so you can get around even without buying a SIM card. A Metrocard. The NYC subway system takes you almost everywhere you want to go and you need a Metrocard to pay. They sell a 7-day unlimited ride card for $32 but since I was only going around for a day, I chose to buy a $10 card ($1 new card fee + $9 value) and have them deduct $2.75 per trip. They offered a 10% bonus for value top-ups worth $5.50 and above (so my card actually held $9.90), but that will decrease to 5% by March 19, 2017. The NYC Subway app. Type in your destination and it will give you a list of suggested routes to take to get there. It will also warn you if there are any train delays. Good walking shoes. I wore my Converse sneakers but they didn’t have enough cushioning 🙁 My feet were hurting by lunchtime. A hotel in a good location. I chose the Vanderbilt YMCA because 1) it was very cheap for Manhattan single-occupancy standards (especially since I arrived during New York Climate Week), and 2) it’s in a great location. Choosing a hotel that’s already near a subway station and places of interest will save you a lot of time. On the flip side, I didn’t feel like the YMCA was worth it because adding maybe $30-40 more per night would have gotten me a much nicer hotel room somewhere else.